Now this is one that didn't come pre-marked on my calendar....how sad! 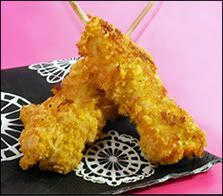 To celebrate National Something on a Stick Day (tomorrow, March 28), Hungry Girl took it a step further than just lollipops and created 3 tasty (and healthy) dishes to eat: Good Chick Lollipops, Veggie Supreme Pizza on a Stick, and Pig on a Stick in a Bacon-Wrapped Blanket. Find her recipes here or make up your own silly variations. After all, I suppose you could put just about anything on a stick, so have some fun.